We offer a range of products to suit industry needs. The various current Die-Sep models will open, tip and close molds from 6X6X6 inch up to molds weighing 50,000 pounds. 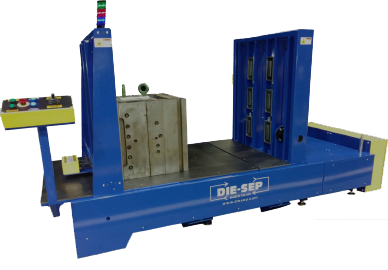 Larger Die-Seps are custom built to suit molds larger than 50,000 pounds. The Mini handles the smallest molds splitting molds up to 3,000 pounds and tipping molds or mold sections up to 2,000 pounds. The Minuteman is capable of splitting and tipping molds up to 6,000 pounds. 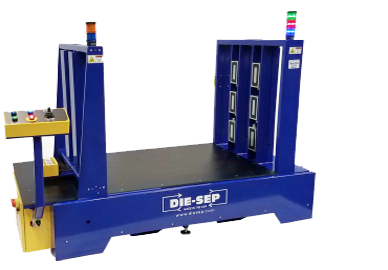 The largest Die-Sep in operation today opens one side of a 64,000 pound stack mold with 22 inch long leader pins and does it in 30 seconds once it is lowered into the Die-Sep.
Tool rooms opening 3 molds per day will usually see a 15 Month ROI and shorter when opening more. MWLT Presentation from Louis Bowler on Vimeo. Our core pull accessory is usually added to the housing of the tipper and this, of course, allows technicians to hydraulically work cores while the mold half is still in the Die-Sep, further saving time and energy from not having to move the mold for testing. This accessory is available in two versions, one with pressure of about 1,700 psi or one with regulated pressures between 250 and 1,500 psi.